Posted on September 6, 2015 by No Map Required Posted in Bali, Places	. Note: The first Mongolia blog has been sent to the editor. This is just a little something to tide you over. In case you haven’t noticed, I’d like to state clearly that we like to do big things. 🙂 In that vein, today was Day One of our 10-day snorkel safari. 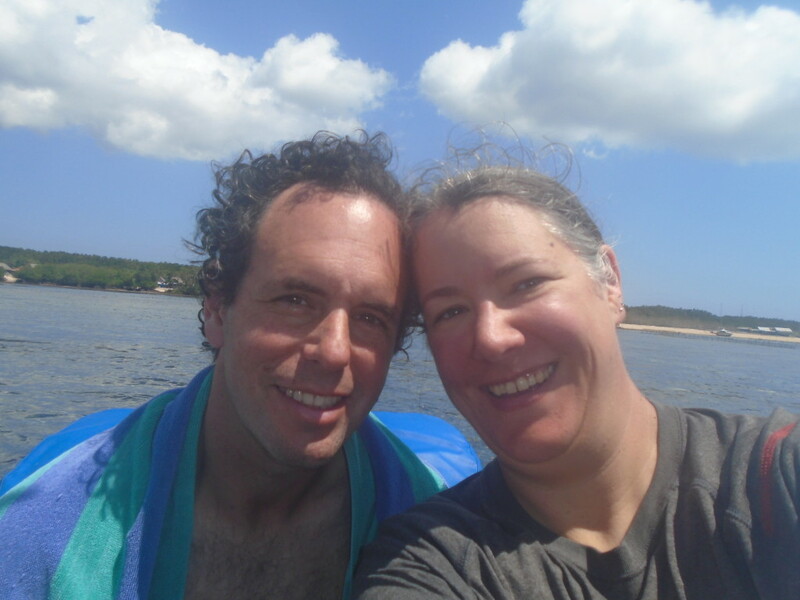 We’ve both snorkeled a lot (me, Anner, especially), but we were not prepared for snorkeling in Bali. Here’s how it went down. We hung in there…faking smiles for the camera. In the morning our guide warned us that the water might be choppy. Aaron had already taken his motion pills and ginger tabs were in a waterproof bag. No problem. (I bet you can already guess where this is going!) The guide gave us wet suits because the water was cold. I wondered just how cold. Then off to the boat for what turned out to be a long and very unpleasant, choppy ride. Arrived at Manta Ray Bay feeling pretty queasy. We both take a ginger tab. I’ve never had to do that. We don our wet suits and hope we’ll feel better in the water. I jump in, like I have at least 100 times before, but hitting the water and I don’t even know what I’m feeling! I. Can. Not. Breath. I’m hyperventilating, I think. As I gasp, people are yelling, “Are you okay?” I figure it out….the water is SO freaking cold I’m in some sort of shock or something. I steady myself and take slow deep breaths. In a minute I’m okay again. Damn the water is cold! This is Bali, not the North Sea. Whatthe… Then Aaron jumps in. Leg cramp. No one can see it so he doesn’t get any shout outs. We’re still queasy, but we do the snorkel. It’s bad, but it gets worse: jelly fish. I’ve snorkeled with jellies before, but these jellies stung. One got in my wetsuit. Can’t breath. Freezing. Jelly fish stings all over my back. Aaron? His snorkel has a hole in it so he’s all those things but he really can’t breath. Does it look so nice and calm and warm?? WRONG!! Get back on the boat. Suddenly we are both very, very seasick. I politely ask the young Aussie BoHunk, “Excuse me. If I have to barf, can I just go right over the side of the boat?” “Yes! Yes, of course. No problem.” I’ve never come close to puking on a boat, but there I was – sure it was going to happen, when Aaron – who hasn’t thrown up in 20 years or so, yaks off the boat…oh and little in my wetsuit. Why not? The jelly fish is probably hungry. We sit quietly on the back of the boat. The feeling fades. A little. We skip the next snorkel. Third snorkel spot we both feel strong enough and jump in and happily it was really good! The water was less North Seas and more Northern California. Not warm, but warmer. 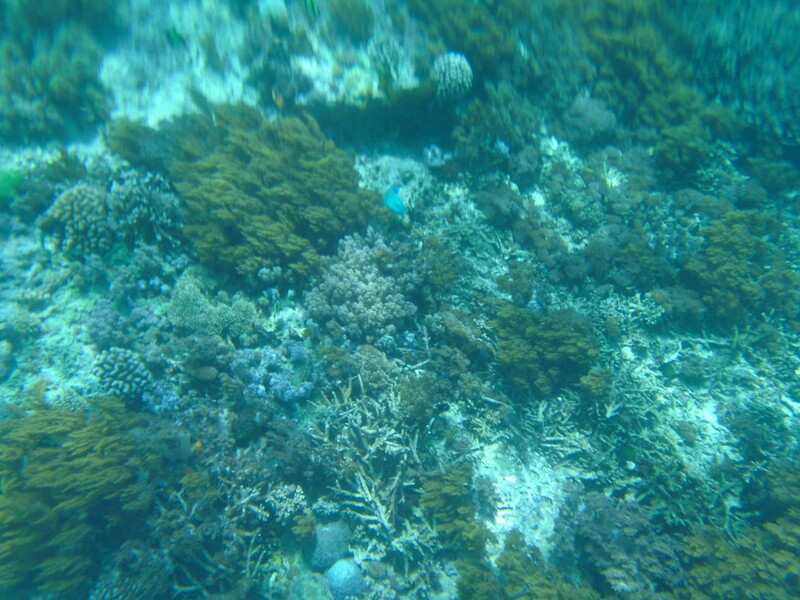 The coral is HUGE! We see giant schools of nemo fish, grouper, trigger fish – really, really big trigger fish! And a zillion other fish. Best of all – we just let the current push us along with our guide and an hour later the boat chugged up next to us and picked us up! We arrived back at the dive school where we refused to pay the rest of our fee until they gave us a play-by-play of the “choppy” water yet to come. Then it occured to us that if we can spend weeks on horseback in the Mongolian Alti, then we can do anything! So with that, we paid the man and tomorrow we snorkel once again! Hey Aussie bohunk can I barf over the side. Bwahaha! Priceless. I’m sorry it was a “choppy” morning. Maybe you had to experience that so tomorrow you can appreciate the gorgeousness of the ocean even more. Fingers crossed for a glassy calm day. We’ll report back tonight. Doubled up on the anti-nausea meds this time! There is always that one time when you are out on the ocean that queasiness sets in even though it’s never happened before. Hope the rest of the snorkel adventure is barf free. The stuff memories are made of!!! So true! Glad today’s went muuuuuch better. A friend could go out on any ship/any boat/any sea state until he hit one particular boat. Hopefully, that you will enjoy the rest of your trip and food stays where it belongs. Carry on, tough ones. Why, yes, we lived to see MUCH better days! 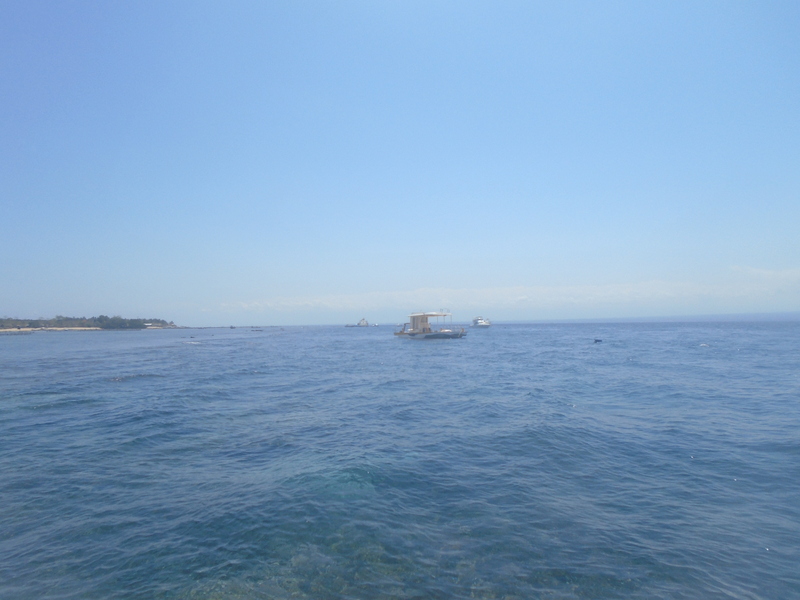 Glorious snorkeling was had by all…and there’ll eventually be another blog to prove it! I’m glad the rest of the snorkeling went better. Barfing in Bali has a good ring to it for a story! We’re all about the story over here! Glad that ring hasn’t lasted, though, as once was enough! Consider them fed enough by us – there shall not be a second time!